Presenting our ABS-Lock SYS I & III lifeline system in moving images: Watch our short product video to find out more about its most important features! Mandatory sign for safety systems, e.g. lifeline systems, manufactured from stainless steel material with weather-resistant, laser-etched specifications. These lifeline systems have been awarded national technical approval and are available in 2 cable thicknesses (6 and 8 mm). They can be used to provide simultaneous fall protection for up to 4 individuals. These stainless steel anchorage systems can be installed on a flat or pitched roof or along a facade to secure your access routes - and there are virtually no limits as to how far you can extend them. Our ABS-Lock SYS I and III lifeline systems are ideal solutions to secure every inch of your surface. 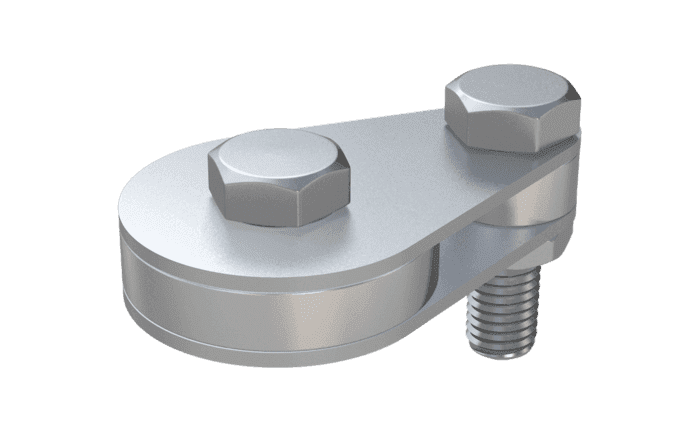 These stainless steel anchorage solutions are based on a steel cable which is hooked up along the edge of a fall danger zone or around a structure where there is a danger of the worker falling through (for example on a flat roof). There are virtually no limits to the length of cable you can install. 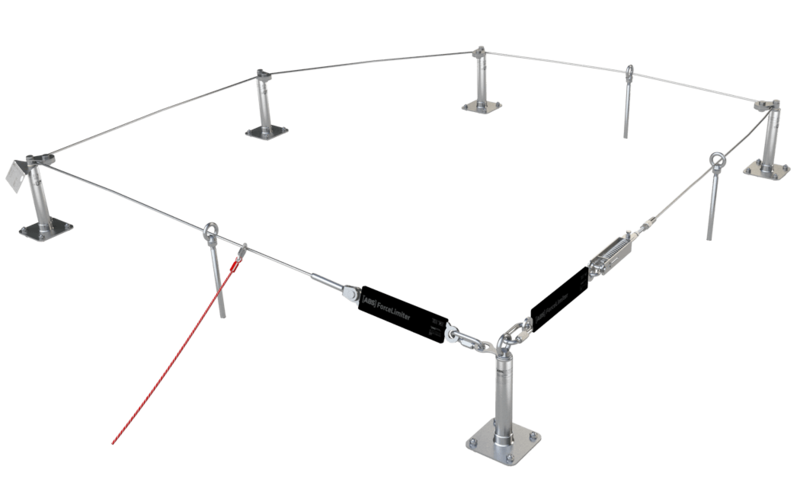 Lifeline systems are typically installed to secure roof surfaces, industrial halls and crane ways. You can choose between our ABS-Lock SYS I which consists of an 8 mm cable or our lightweight ABS-Lock SYS III with its 6 mm cable. Both cables - like nearly all of our lifeline system components - are manufactured from extremely durable V4A stainless steel material. Our ABS-Lock SYS systems are designed to provide individual rope-up protection - simply use them in combination with your personal protection equipment (PPE). 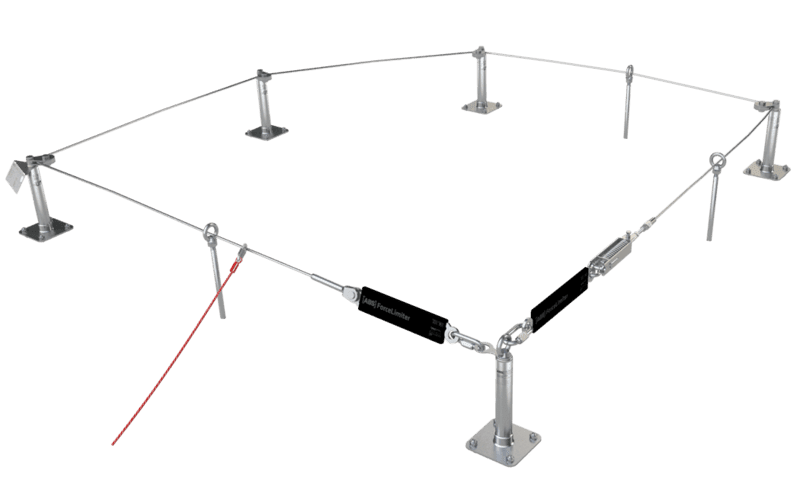 Up to 4 individuals can connect up the carabiner hooks of their lanyards (retaining cable between the individual and the fall protection device) to the cables of these non-traversable anchorage solutions. 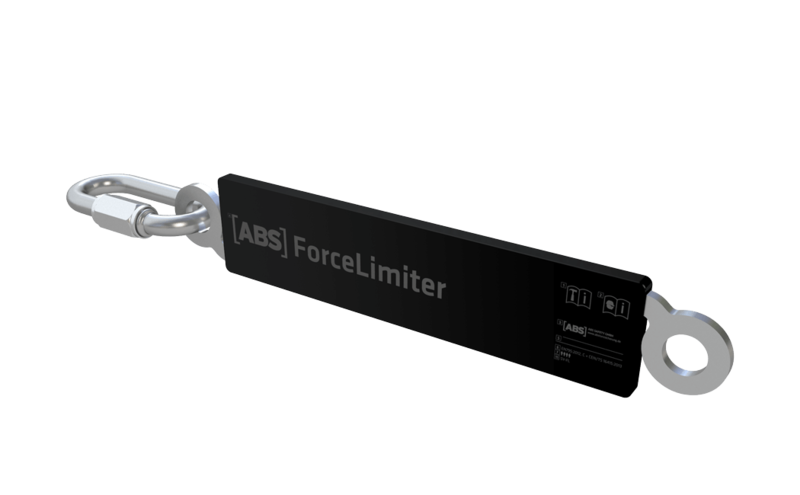 If the user falls, the ABS ForceLimiter reduces the ensuing force to a minimum. The cable, coupled with the system supports which have been specially designed to buckle under stress, distributes the remaining energy into the subsurface to arrest the fall. When installing these fall arrest solutions, you have a huge selection of anchorage points for virtually any surface to choose from: Nearly all of our anchorage points can also be used as an intermediate support (Ø 16 mm) in a lifeline system. Whether your surface is made of steel, concrete, wood or metal sheeting - all you need to secure your workers in any working environment is the right support. 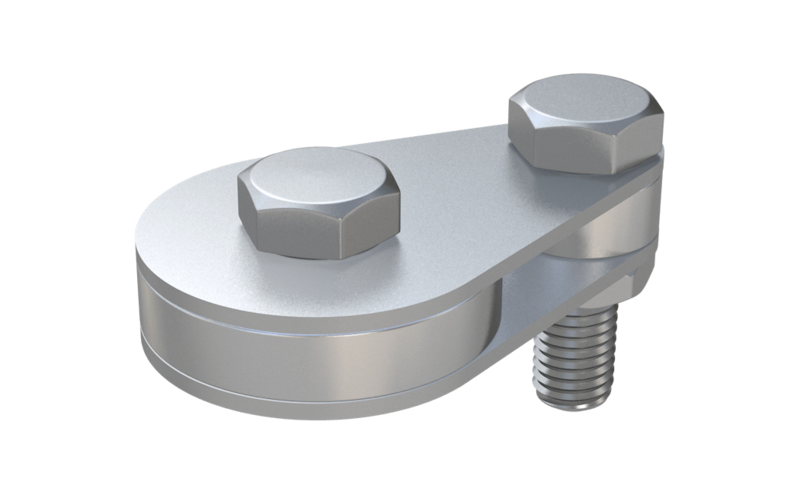 The corner and end brackets are reinforced using special supporting tubes (Ø 42 mm) which are capable of withstanding the prescribed pre-tensioning load. If your cable runs in a straight line, simply feed the cable through the ring eyelets of the anchors. To go around corners or other obstacles, use a specially-designed ABS SolidCurve pulley wheel. The cable can be flexibly installed at angles from 0-180°. This allows you to individually adjust your lifeline system to fit any architectural design. 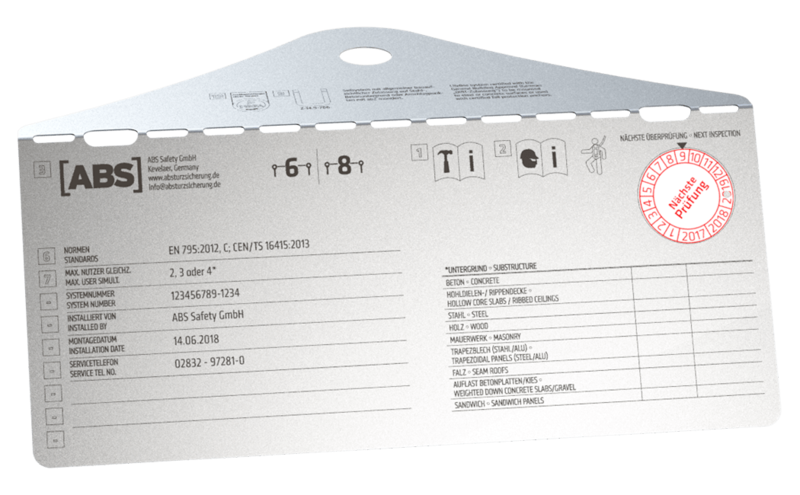 All ABS Safety lifeline systems have been awarded national technical approval ("abZ") by the German Institute for Construction Technology (DIBt) and are labelled with the required Ü symbol. 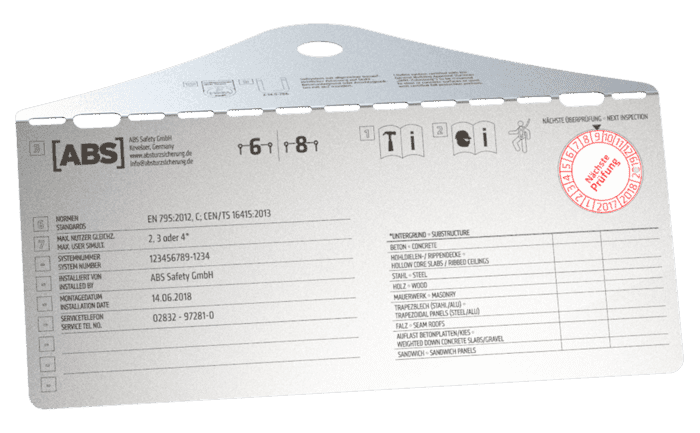 The abZ includes information on all the installation methods and surfaces (concrete, steel, single anchorage points with an abZ and/or ETA) approved by the DIBt. 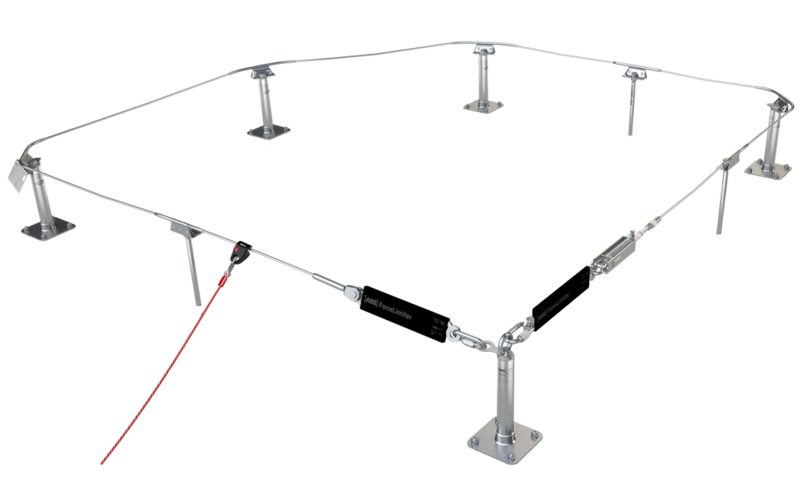 Naturally, all our systems have also been tested in accordance with EN 795, type C.
Our ABS-Lock SYS I and III lifeline systems offer a cost-efficient, non-traversable fall arrest solution. If you are looking for an interruption-free fall protection solution, we recommend using an ABS Lanyard Y (tested in accordance with EN 354 and EN 355). This dual band model provides uninterrupted protection as the two carabiner hooks are unhooked and hooked back up to the cable one at a time when the user reaches an intermediate post. Are you looking for a traversable solution which can be used in combination with gliders? Then take a look at our ABS-Lock SYS II and ABS-Lock SYS IV lifeline systems. Or contact our Team directly. They will be happy to provide you with all the help and advice you need.